W.C. Fields, who was born in Philadelphia, used to make fun of his birthplace as a staid and boring place by threatening to have the line, “All things considered, I’d rather be in Philadelphia,” as the epitaph on his gravestone. (Apparently, that threat was never carried out.) Philadelphia has often been overshadowed by New York to its north and by Washington to its south. I remember traveling to Philadelphia to visit my relatives when I was a child, my siblings and I fidgeting in the back seat of the car as my father fought through the traffic on the ugly New Jersey Turnpike. My grandmother Eva Cohen and her second husband Frank Crocker lived in what I remember as a small apartment in Philadelphia, and somehow it was always hot and humid whenever we visited. I was only nine when my grandmother died, so my memories are somewhat vague, but I do remember watching a baseball game with Poppy Frank, as we called him, discussing the merits of Sandy Koufax versus Don Drysdale (the Phillies were obviously playing the Dodgers that particular visit). We would sit and visit for a while, have lunch or dinner, and then pile back in the car, suffer through the Jersey Turnpike again, fidgeting and bickering in the backseat. So I guess I could relate to W.C. Fields’ sentiments about his hometown. Somehow I associated Philadelphia with long car rides, being tortured by my siblings, and hot, humid weather. I wish I could remember more about my grandmother, but as a child, I was focused on childish things. Well, and baseball. As I wrote before, I remember her as beautiful, reserved, and very dignified, a true gentle-woman in both senses of the word. So given my somewhat skewed views of the City of Brotherly Love, I did wonder why my Cohen relatives (and in fact all of my father’s lines) ended up in Philadelphia. They sailed into New York City—why did they leave the Greatest City in the World to go to its poor stepsibling to the south? I asked my father, who was born and raised in Philadelphia, this question the other day, and he said something about William Penn and how Philadelphia was a Quaker city and probably more tolerant of Jews. I decided to do some research to answer a couple of questions: What was Philadelphia like for Jews in the 1840s and 1850s when the Cohens arrived? Where did they live in the city, and what were the socioeconomic conditions like in those areas? What drew them there instead of New York or some other American city? I found a wonderful resource, a book by Robert P. Swierenga, a historian who has published several books about the Dutch in the United States. The book I relied on is titled The Forerunners: Dutch Jewry in the North American Diaspora (Wayne State University Press 1994), and in it Swierenga traced the immigration of Dutch Jews to America and their settlements in several US cities, including Philadelphia. I read the chapter on Philadelphia and learned not only about the Dutch Jews who settled there, but more generally about the history of Jews in Philadelphia. After reading this chapter, I better understand why the Cohen family decided to settle there. In his discussion of Dutch Jews, Swierenga included not only those who came directly from the Netherlands (meaning primarily Amsterdam), but also those, like my ancestors, who had emigrated from Amsterdam to England before coming to America. Based on his research, he concluded that for the most part the Dutch Jews who came to Philadelphia tended to come directly from Amsterdam whereas those who had first stopped in London tended to end up in New York. Swierenga found that in 1850 and 1860 there were only two Dutch Jewish families in Philadelphia who had had children born in England. (Swierenga, p. 125) Was he counting my relatives? Hart Levy Cohen’s children were born in England, but did they count as “children?” On the other hand, Jacob’s daughter Fannie was born in England, and although his later children were born in the US, his family must have been one of those two families. 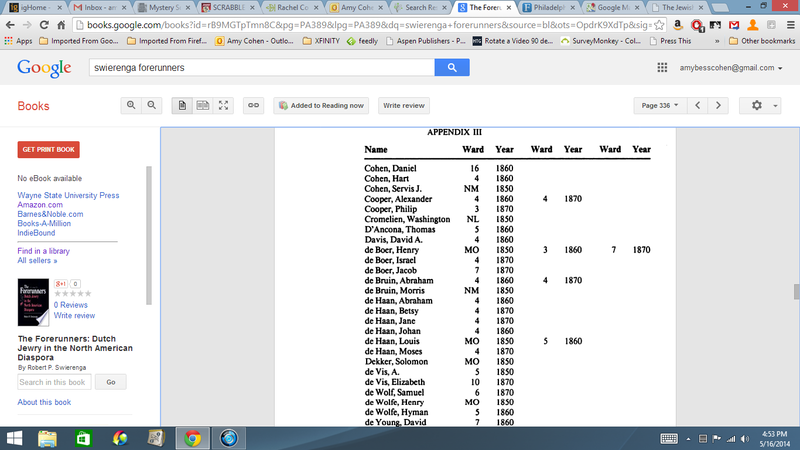 In fact, this screenshot from Appendix III in Swierenga’s book, captioned “Dutch Jewish Household Heads and Working Adults in Philadelphia 1850, 1860 and 1870,” shows that Swierenga did count Hart Cohen as one of those Dutch Jews. I found this observation very interesting. Obviously, my ancestors did make that two-stage migration. Did they do that because they could not afford to get directly to the US, or did they originally plan to stay in London? Does this mean that Hart and Rachel were not as well-off as many of the other young couples who left Amsterdam at the end of the 18th century? Between the 1850s and 1880, however, the Dutch Jews increasingly left the south side of Philadelphia and moved to neighborhoods further north. 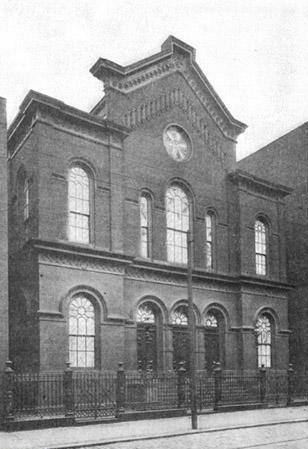 Those who remained could not support their own synagogue, and B’nai Israel was closed in 1879. By the end of the 19th century, the Dutch Jewish community had integrated into the larger Jewish community and had disappeared as a separate cultural subgroup. (pp. 135, 320) As I move forward from 1860 in tracing my Cohen relatives, I will keep in mind this shift to see whether or not they were a part of that trend. After reading this material and understanding more about the history of the Jewish community in Philadelphia in the first half of the 19th century, I better understand why my ancestors chose Philadelphia. It had a distinct Dutch Jewish community, which might have been very attractive to them after the Chut experience as outsiders in London. It had a long history of a diverse but cooperative overall Jewish population. And perhaps, like today, it seemed less overwhelming and more affordable than New York City. I now read, “All things considered, I’d rather be in Philadelphia” in a whole new light. 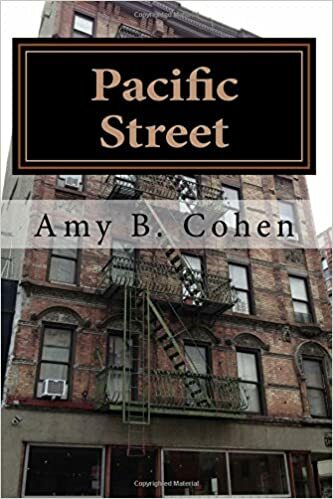 This entry was posted in Amsterdam, Books, Cohen, England, Miscellaneous information and updates, Pennsylvania, Philadelphia and tagged Amsterdam, Cohen, Congregation Mikveh Israel, Congregation Rodeph Shalom, immigrants, Jews, Netherlands, New York, Philadelphia by Amy. Bookmark the permalink. How long had the Cohens been in Holland? From where did they come to Holland? Growing up in Philadelphia, we knew that different neighborhoods were occupied by certain nationalities. It was a way of life. What is that neighborhood like now around 136 South Street? I wonder if the house they lived in is still there. This is very interesting. I wish I had spent more time in Amsterdam learning about situation of the Jews. Guess we’ll have to go back. I am all on board with that! I loved Amsterdam.